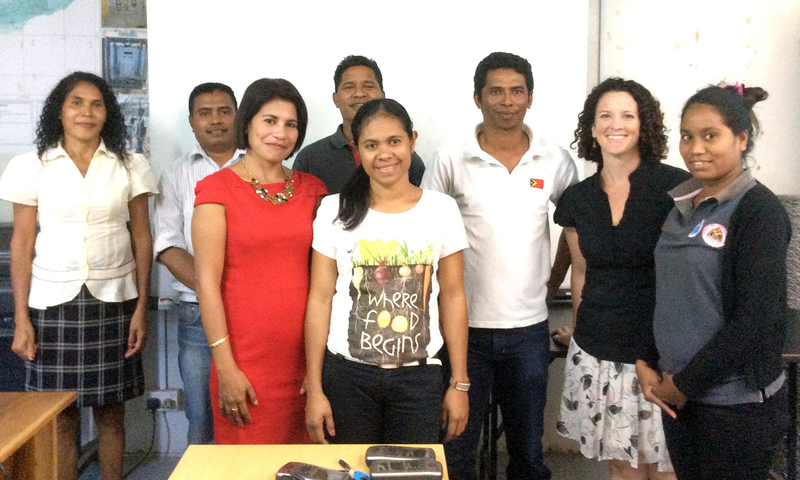 NOAA Fisheries’ team members Annette DesRochers and Max Sudnovsky of the Coral Reef Ecosystem Program (CREP) recently returned from a productive visit to Dili, Timor-Leste. Nearing the end of a four-year collaborative partnership between NOAA and the U.S. Agency for International Development (USAID), DesRochers and Sudnovsky conducted a workshop over three days in support of the Government of Timor-Leste’s Ministry of Agriculture and Fisheries (MAF) Agriculture and Land-Use Geographic Information System (AL-GIS). Workshop participants from left to right: Alsina F Moulein, DNPA; Horacio Santos, DNGRIP; Maria B de Jesus, DNPs; Orlando H. Kalis, DNGRIP; Rita Soares, DNPs; Jose Quintao, DNPs; Annette DesRochers, NOAA; and Adina Alves, DNPs. Workshop participants not present in the photo include Alda Sousa, DNPA and Max Sudnovsky, NOAA. 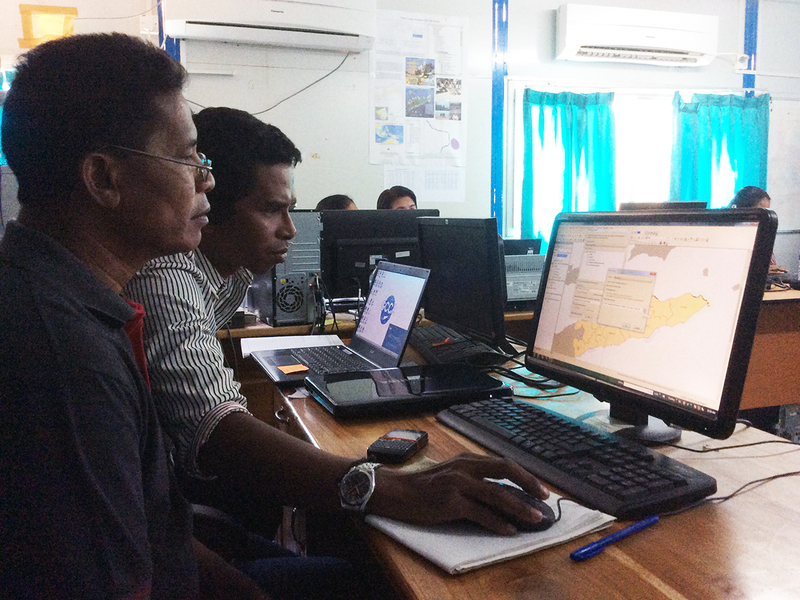 The workshop was designed to provide the AL-GIS team with an introduction to how NOAA manages coral reef data and how to link the science to support fisheries management in Timor-Leste. Workshop participants from the Directorate National Fisheries and Aquaculture (DNPA), Directorate National for Resource Management and Inspection (DNGRIP), and the Directorate National for Research (DNPs) explored how to make use of the data collected by NOAA-CREP in Timor-Leste. Workshop participants navigate maps of Timor-Leste with the coral reef data collected by NOAA. Through a series of instructional and “hands-on” GIS exercises, participants learned how to create maps of coral reef baseline data, collected by NOAA and our partners, from 2012 to 2014 and utilize the satellite-derived basemaps that NOAA-CREP developed for the nearshore areas around Timor-Leste. This workshop was made possible in part with funding from the NOAA Fisheries International Activities and Seafood Inspection Program and served as an interim opportunity to share the draft data results that have been prepared by NOAA-CREP through the NOAA-USAID Timor-Leste partnership. The final results for in-country presentation will be coordinated with MAF in early 2016. Example of the WorldView-2 satellite image and ground-truth data (left) used to derive bathymetry for the near-shore areas around Timor-Leste (right). Following the workshop, Michael Abbey of the International Activities and Seafood Inspection Program held a half-day meeting for the MAF fisheries managers and participants from the GIS workshop. The goal of the meeting was to discuss how to bridge the gap between fisheries management and GIS in the context of an Ecosystem Approach to Fisheries Management and to explore NOAA’s potential future engagement to support such activities in Timor-Leste. The NOAA team also participated in a U.S. Embassy Outreach event, “Amérika iha Timor-Leste: Parseria ba Prosperidade,” at Timor Plaza. This event was a day-long exhibition showcasing the relationship between the United States and Timor-Leste. At the event, participants learned about initiatives in the areas of economic growth, defense cooperation, democracy and governance, safety and security, health, education, and inter-country exchange to build a more prosperous Timor-Leste. Visitors also participated in many activities, contests, and quizzes—both live and online—throughout the day. The NOAA booth was one of the most popular stops for many parents and children! Photo from the U.S. Embassy outreach event. From left to right: Annette DesRochers, NOAA; John Seong, USAID; Flavia Da Silva, USAID; Karen Stanton, U.S. Ambassador for Timor-Leste; Max Sudnovsky, NOAA; Michael Abbey, NOAA. This entry was posted in coral reef ecosystem and tagged Agriculture and Land-Use Geographic Information System, AL-GIS, Annette DesRochers, Coral Reef Ecosystem Program, CREP, Directorate National Fisheries and Aquaculture, Directorate National for Research, Directorate National for Resource Management and Inspection, DNGRIP, DNPA, DNPs, EAFM, ecosystem approach to fisheries management, GIS, Government of Timor-Leste, International Activities and Seafood Inspection Program, MAF, Max Sudnovsky, Michael Abbey, Ministry of Agriculture and Fisheries, NOAA Fisheries, PIFSC, satellite, U.S. Agency for International Development, U.S. Embassy, USAID, WorldView 2, WV2. Bookmark the permalink.